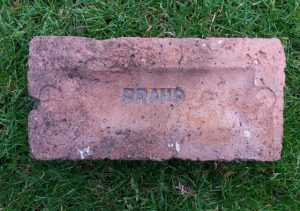 The name Brand crops up twice in “A Survey of Scottish Brickmarks” with the first instance being Robert Brand proprietor/owner of Garturk Brickworks and the other, James, Janet and Robert Brand, also proprietors/owners, of Rochsolloch Brickworks. 21/05/1855 – Glasgow Herald – Fire brick works for sale – To be sold, the Rochsolloch Fire Brick Work near Airdrie. The work is situated on the bank of the canal and the supply of fire clay is abundant and of excellent quality. There are 3 kilns, one of them on the principle of Ferguson, Miller & Co’s Patent; and all having been in use for only a few months, are in good condition. Offers to be given by the 31st instant to Mr Smith at the works who will give all particulars. 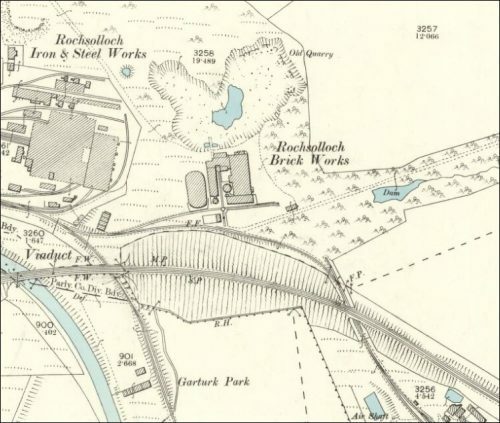 29/10/1855 – Glasgow Herald – Fire Brick Works for sale – to be sold by public roup upon the field, on Thursday the First November next, at Twelve o’clock Noon, The Rochsolloch Fire-brick Work, near Airdrie. The Work is in the immediate neighbourhood of the numerous Ironworks of the district, and has facilities for transit by canal and railway enjoyed by few works of this kind. The Work, which is quite new, has been erected on the most approved principles, and contains an Engine of Fourteen Horse Power, Two Grinding Pans, a Tunnel for drying Bricks, of a new construction, and Three Kilns, capable of burning 65,000 Bricks-one of these on Ferguson, Miller & Co.’s patent plan. The supply of Clay is abundant, of excellent quality, and to be had at a low price. For further particulars, apply to Mr. Wilson, of the Rochsolloch Pits, adjoining the Work; Mr. John Smith, 87 Alexander Street, Airdrie; Mr. David Crichton, Auctioneer, Coatbridge; or Mr. J M.Taylor, Writer, 20 St. Vincent Place; in whose hands are the articles of the roup. Glasgow, 20th October, 1855. 27/03/1857 – Glasgow Herald – Fire brick work to be let – situated on the Canal Bank at Rochsolloch near Coatbridge. The erections are almost new, are in good working order and immediate entry can be had. Mr Wilson at Rochsolloch Colliery will show the works and give all information. 10/04/1857 – Glasgow Herald – For sale , the Rochsolloch Fire Brick Works and a lot of about 200,000 fire and composition bricks. There will be exposed to Sale, by Public Roup, on the Ground at Rochsolloch, near Coatbridge, on Monday the 20th April, 1857, at Half-past One o’clock P.M., The Brickwork known as the Rochsolloch Fire Brick Work, and situated in the immediate neighbourhood of Coatbridge and Airdrie. The Work consists of Two Kilns, capable of burning about 20,000 each; a large Wooden Drying Shed, and One Kiln, presently used as a Drying Stove; together with a Steam Engine of 15 Horse-Power, with Boiler, &c., and Grinding Mills-is also a Dwelling House on the Property, suitable for a Manager. The Work is most conveniently situated on the bank of the Canal, and possesses easy and direct communication with Port Dundas and the numerous Iron Works in the neighbourhood. The Property is held on Lease, which can be extended for such period of time as may be wished. In the event of not being Sold in One Lot, the whole Work, including the Steam Engine, Boiler, Grinding Mill, Kilns, Chimney Stalk, Brick Tunnels, Wooden Shed and Planking, Iron Rails, and a variety of other Material and Implements will be exposed in Lots to suit Purchasers, and for removal from the Premises. There will also be Sold, at the above time and place, about 200,000 Fire and Composition Bricks, of very superior Make and Material, in Lots of 5000 of 10,000 to suit Purchasers.For further particulars, apply to Mr. John Thomson, Glenboig Brickworks; or to Taylor & Craig, Writers, 20 St. Vincent Place, Glasgow, who will show the Conditions of Sale; or to the Subscriber. David Crichton Auctioneer, Sunnyside, Coatbridge. Below – 1858 – Rochsolloch Brick Works. 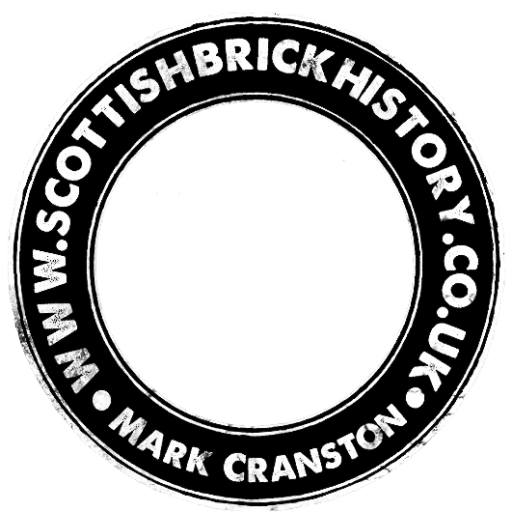 13/07/1860 – Glasgow Herald – To builders and consumers of bricks – Clark, Walker & Co, brick manufacturers, Rochsolloch Brickworks near Coatbridge are prepared to supply composition and fire bricks of a first rate quality and on moderate terms at their depot , Monkland Basin, North Side, St Rollox. Apply at the depot or their office, 112 West George Street. 1858 – 1861 – Parish of New Monkland – Census – Rochsolloch Brick Works – Mr James Clark, Messrs Clark & Walker. Mr Cowie. An establishment for the manufacture of common and fire bricks, the whole conducted by Messrs Clark and Walker. 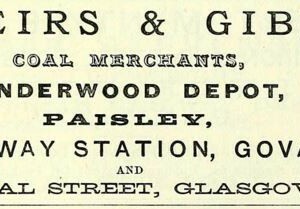 21/12/1861 – Perry’s Bankrupt Gazette – James Walker, John McAra senior, and Biby Leonard, Iron and Brick Manufacturers, Rochsolloch, Airdrie as regards Walker 5th December (Rochsolloch Brick Works?) Scotch bankruptcy 06/12/1855. 1878 – James Miller – Facing bricks, Rochsolloch (Roshollock) Fire Clay Works, Coatbridge, Lanarkshire. 1882 – David Brownlee , Brick and Tile maker and builder, Rochsolloch. Below – 1882 – Advert – David Brownlee Brickmaker, Rochsolloch, Coatbridge. Below – 1886 – Advert – David Brownlee Brickmaker, Rochsolloch, Coatbridge. 19/06/1886 – Lanarkshire Upper Ward Examiner – In the Sheriff Ordinary Court at Linlithgow, an action was recently raised at the instance of David Brownlie, Rochsolloch Brickworks, Coatdyke, Coatbridge, against William McAward, builder, Linlithgow, for the sum of £35 18s, as being the amount of an account for bricks supplied between 28th October 1884 and 4th February 1885. For the defender, it was maintained that the bricks alleged to have been sold and delivered by the pursuer to the defender were not sold to him as an individual, but were, on his orders, sold and delivered to the partnership or joint adventure of McAward & McKarney, bricklayers, Falkirk, for the building, by special contract, of a school and schoolhouse at Slamannan in connection with the Roman Catholic Church. Below – 22/05/1888 – Glasgow Herald – Accident at the Rochsolloch Brickwork. William Cullen badly injured by a fall of fireclay. 1896 – David Brownlie (spelling?) Brick Maker, Rochsolloch, Airdrie. 1896 – Alex Coltart, Brick Maker Rochsolloch, Airdrie. Below – 1897 – Rochsolloch Brickworks. 04/11/1899 – Airdrie and Coatbridge Advertiser – Wanted a young man as a clerk. Apply Rochsolloch Brickworks, Airdrie. 1903 – Brick making plant and machinery for sale. Rochsolloch Brick Works by Airdrie. Entry no 740 -Records of Shirlaw Allan, Industrial auctioneers, Hamilton, Scotland. Below – 14/08/1920 – The Scotsman – Sale of Rochsolloch brick works due to David Brownlee retiring. 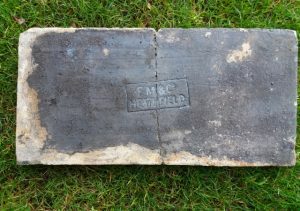 Found in Glasgow by CFA Archaeology Ltd between 2010 and 2011 during archaeological works in advance of the development of the Commonwealth Games Athletic Village at Dalmarnock, Glasgow. The brick was disclaimed by Treasure Trove. Heathfield Fireclay Works, Garnkirk. Ferguson, Miller & Company (ca 1845-1862). Sadly this oversized block is split in two. . . . …. 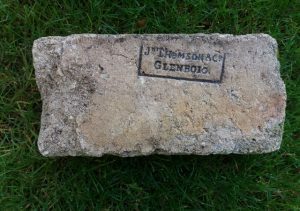 Found at Glenboig Fire Clay Works John Thomson Glenboig Glasgow. 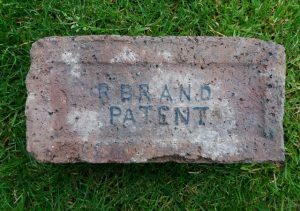 Patent to rear This brick is likely to be dated between 1843 and 1860. . . . .
Found at ruins in Muirshiel Country Park near Lochwinnoch, Renfrewshire by Willie Guthrie. 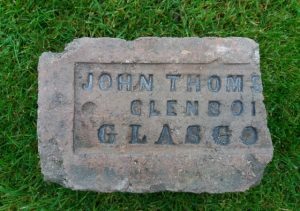 John Thomson & Co, Glenboig . . . . Below – broken example found at Glenboig Fire Clay Works . 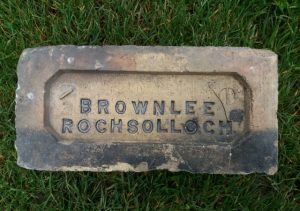 Found Cardross, Helensburgh David Brownlee , Brick and Tile maker and builder, Rochsolloch Brick Works, Coatbridge . . . .